In-life upgrades say a lot about a car; an opportunity to address howling oversights, or to bring in new drivetrains and re-challenge the newcomers. Yet, despite Mazda getting in ahead of an accelerating avalanche of compact SUVs, it’s hard to separate the new and old CX-3 even with a press pack in hand. Fine-tuning is a familiar approach from Mazda, but it adds up. The thick-rimmed steering wheel is shared with the MX-5, linked to recalibrated power steering and working with re-tuned suspension dampers. It -3 also now gets G-Vectoring Control, which reduces engine torque to shift load onto the front tyres at the start of a corner for more grip, then re-applies it intelligently to keep it balanced through the turn. Plenty of manufacturers claims to put the ‘Sport’ into ‘Sport Utility Vehicle’, but the CX-3 delivers. It’s reassuringly mechanical, agile and linear in the way it responds to driver inputs. All without crashing over rough surfaces for the other 95% of the journey. Mazda also re-tuned the engine mounts and added extra sound-absorbing material, all adding up to bigger-car refinement. As before, there’s a three-trim line-up with limited optional equipment, and three engines. 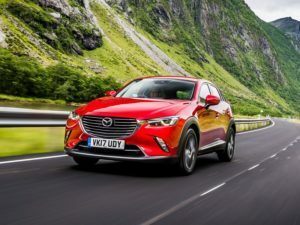 Instead of downsizing and turbocharging, Mazda used a 2.0-litre, unit from its larger cars, offered with 118bhp or 148bhp, the latter with four-wheel drive. It’s quiet, keen to rev and suits the sporty chassis setup perfectly, helped by precise, short-throw gear changes, and previous experience suggests it should come close to the claimed 47.9mpg on the road. The 1.5-litre diesel takes only 20% of UK volume, and reduce fuel and tax costs mean it’s still the better fleet option, despite the £1,200 price disadvantage. It wasn’t available to drive at the launch, but the update includes new technology to sharpen throttle responses and cut noise under load. Small changes, but good enough to put it in with the class best.